When used incorrectly, even solutions made from common household ingredients can damage beneficial organisms and the environment. This is a guide about the right way to spray insecticides and fungicides. 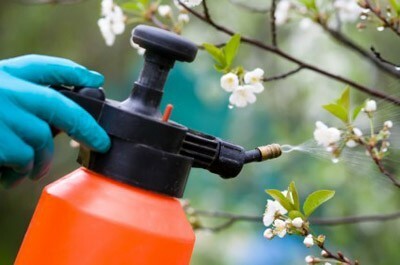 In organic gardening, spraying insecticides and fungicides (even if deemed safe) should only be done as a last resort. Although they are often botanically derived and considered "less harmful" than synthetic chemicals, organic chemicals are still chemicals. When used incorrectly, even solutions made from common household ingredients can damage beneficial organisms and the environment. 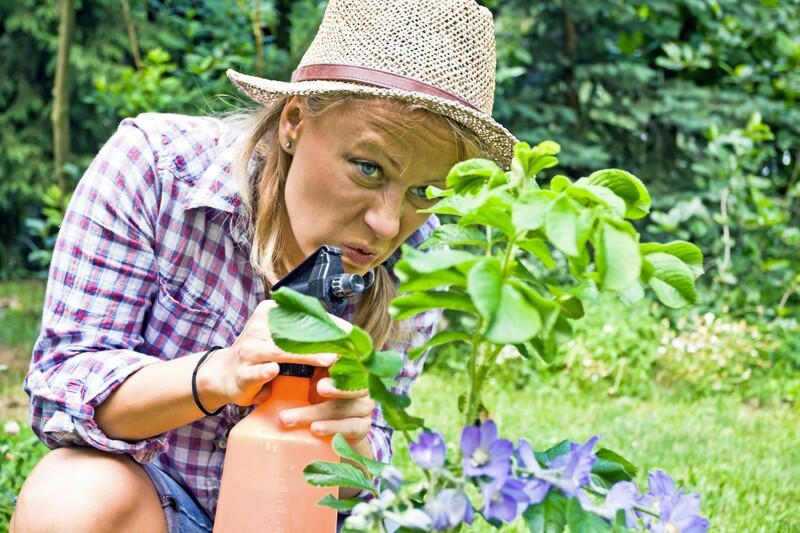 If you have to spray, here are some tips on how to do it safely. For smaller jobs, use a hand-held trigger sprayer (e.g. plant mister) for liquids made from household items like dish soap, essential oils, garlic, and peppers. Label the sprayer botanical pesticide. To avoid cross contamination, never use the same sprayer for different applications. Designate a second sprayer for applying fungicides and a third for using liquid fertilizers. For larger jobs, use a pump sprayer that you can pressurize manually. Try to fill it with no more or less than you need to finish each job. This reduces the amount of times you need to refill the sprayer (and expose yourself to chemicals) and eliminates the need to dispose of excess chemicals. When applying botanical or biological dusts (e.g. sulfur, fungicides, BTK, pyrethrin, diatomaceous earth, etc.) it's best to use a plant duster. These increase the effectiveness of the products (and minimize waste), because they are designed to spread the product evenly across the surface of the plant, while covering hard-to-reach areas. Always wear rubber gloves, goggles, and disposable mask to avoid ingesting or inhaling the dusts. To avoid chemical drift, always wait for calm weather before spraying chemicals. Before you spray, harvest any fruits and vegetables are that are ripe and ready to eat. Not only will this protect your food crop, it will also reduce your need to enter the treated area while the chemicals are actively at work. Consider erecting a temporary fence or barrier to prevent children and pets from entering the area. Apply pesticides and fungicides in the early morning or evening hours when beneficial insects are less likely to be active. This will also reduce the likelihood of causing chemical burns to the plant's leaves during the hottest part of the day. If possible, put a row cover over the area for a day or two to keep pollinators and other beneficial insects out of the area. Check to see that spray nozzles are open and that your equipment is working properly before you fill it with chemicals. Clean and dry all equipment after use and dispose of any excess chemicals according to manufacturer recommendations. Read and follow all manufacturer directions carefully, paying special attention to warnings and what to do in case of an emergency. Where long pants, shoes and socks, and a long-sleeved shirt and rubber gloves. When applying liquid pesticides, avoid wearing leather or canvas shoes, which can readily absorb chemical drips and spills. Wear a disposable dust mask on your face as well as eye protection. Wash your hands and launder your clothing immediately after you finish. Keep children and pets indoors until your finished spraying. Just a reminder, read the label every time! Even if you think you know what the label says, read it again! Sometimes fruits and veggies are dropped from labels because of tolerance issues - too much of a certain chemical getting into the food supply, so the EPA removes uses.